This thematic study of later-twentieth-century school buildings was commissioned by English Heritage’s Schools Working Group. Post-war demand for places encouraged local authorities to think in terms of programmes of schools rather than one-offs. To this end, prefabricated systems of construction were organised into school building ‘consortia’, but from c.1973 ceded to ‘rationalised traditional’ construction, usually in brick. Falling pupil numbers and cuts in public expenditure made the last quarter of the twentieth century an era of contraction, rationalisation and rehabilitation of building stock. Prescient themes of the 1980s include energy conservation, more enclosed plans and the introduction of market forces. 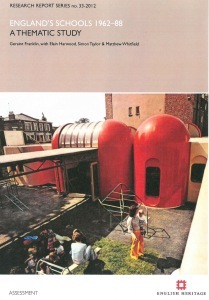 Primary school design facilitated informal, ‘child-centred’ learning in various ways. A variety of group sizes and activities was encouraged by the sharing and inter-connection of teaching space. The 1963 ‘Newsom report’ on secondary education challenged traditional subject boundaries and called for specialised resources and informal plans. Secondary education was dominated by questions of selection and transfer between educational stages, and middle schools were as much an element of non-selective reorganisation as an educational concept in their own right. Assimilation was a major theme, with facilities for the wider community and disabled children integrated into mainstream schools.